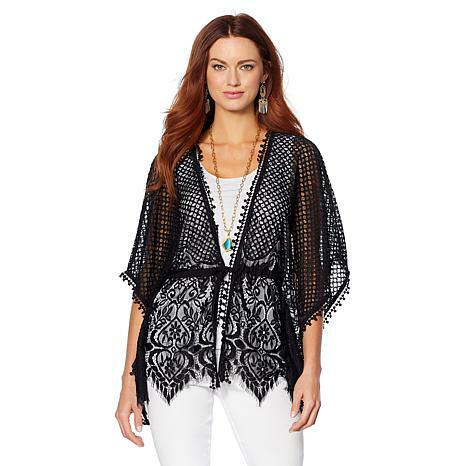 Transform any ensemble by adding this versatile lace kimono topper as the finishing touch. 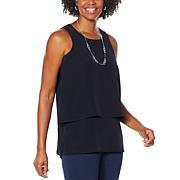 Enhance the look of a simple tank dress or jeans and a tee. Better yet — pair it with a swimsuit and floppy hat for impeccable poolside flair. 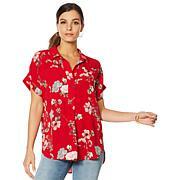 Fit: Very Loose-Fitting: Designed for 7 or more inches of easy between body and garment. Measures at least 7 inches larger than the fit-critical body measurement. Cut very full for complete ease of movement and fabric drape. The medium/ large in black was perfect. I am a true medium. I feel it is slimming with a black tank. Good quality. 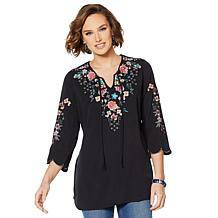 I was able to get this in black on clearance price, I am 57, 155 pounds, got this in med/Large, its a little big small was sold out, but for the price and its so cute Im keeping it. Colleen Lopez did it again!! She has such a great taste and keen eye for detail without going overboard. She instinctively knows what looks great on any shape or size. I really love this topper!! It's beautiful!! This kimono can be dressed up or down. 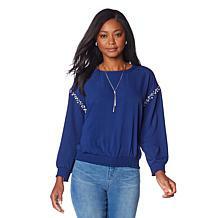 I got the marine blue to wear next spring and summer. If all the colors had been available in my size, I would have gotten them all!! I selected the Marine Blue. It wasn't quite as vibrant as I'd hoped but it's very pretty. The lace surpassed my expectations and I got it on a Clearance so I really hit the motherlode.